These decorative sound absorption panels are specifically designed to reduce both reverberant and low frequency noise. 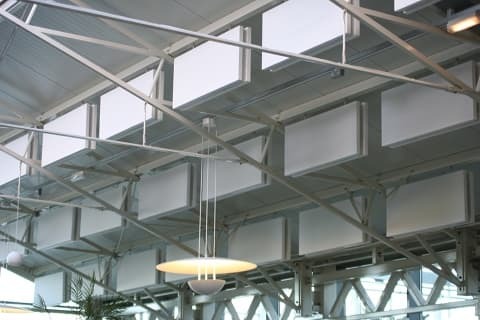 Acoustic Baffles are an effective, economic alternative to a full suspended acoustic ceiling and can be conveniently hung without disturbing existing light fittings, surface mounted features or services. They can be used to upgrade the acoustic environment to Building Bulletin 93 (BB93) standards. All panels are supplied with appropriate panel fittings and several panel versions are available, dependent on the desired effect and the specified acoustic performance. Decorative, flame retardant, fabric covered acoustic panels manufactured from dense sound absorbing mineral fibreboard. All panels are fabric wrapped to the face and visible edges and are available in 25mm or 50mm thicknesses. Standard or bespoke panel sizes are available based on a straight edged design, allowing for flexible design options (square, rectangle or triangle shapes). visible edges. Standard or bespoke panel sizes are available based on a straight edged design. Decorative, flame retardant acoustic hanging panels manufactured from ultra-light weight open cell Melamine Foam, supplied in either white or light grey. Visible edges. 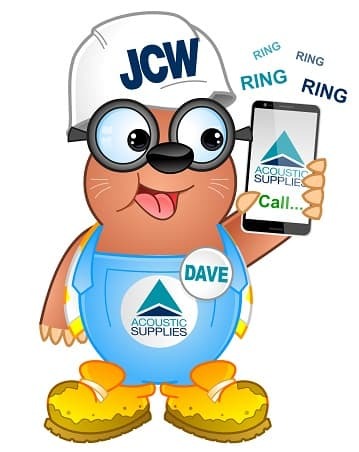 Standard or bespoke panel sizes are available in various thicknesses. Unlike fabric covered absorbers, natural Melamine Foam can be cut to form virtually any design shape. These panels can be PVC spray painted with any BS or RAL colour to co-ordinate with the architecture or aesthetics of a room space.